Burnt your ghee? Never again! 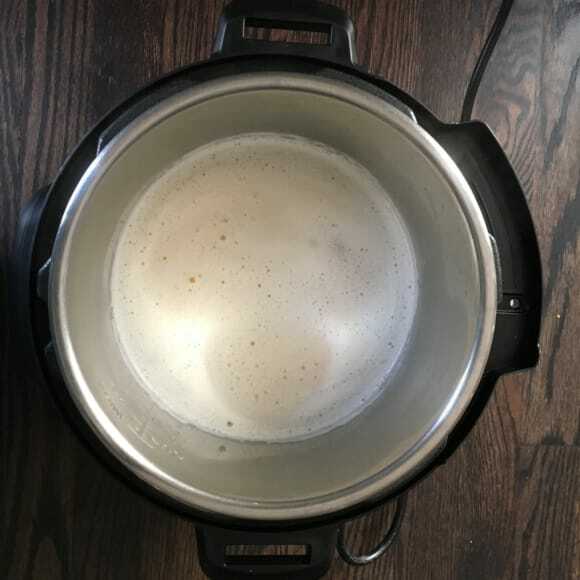 Follow this detailed fail-proof recipe with step by step pictures to make ghee in Instant Pot and say goodbye to storebought ghee. 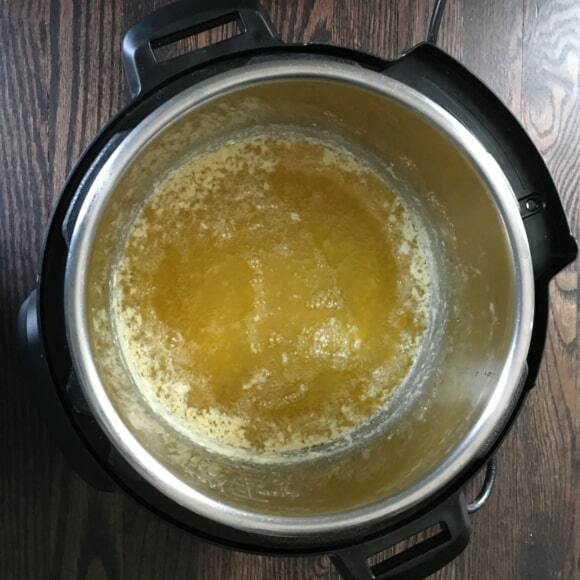 Making ghee in Instant Pot is so easy – just pop the butter in the Instant Pot and voila – you’ll have homemade ghee in no time. Before you learn how to make ghee in Instant Pot, read the most asked questions about ghee. 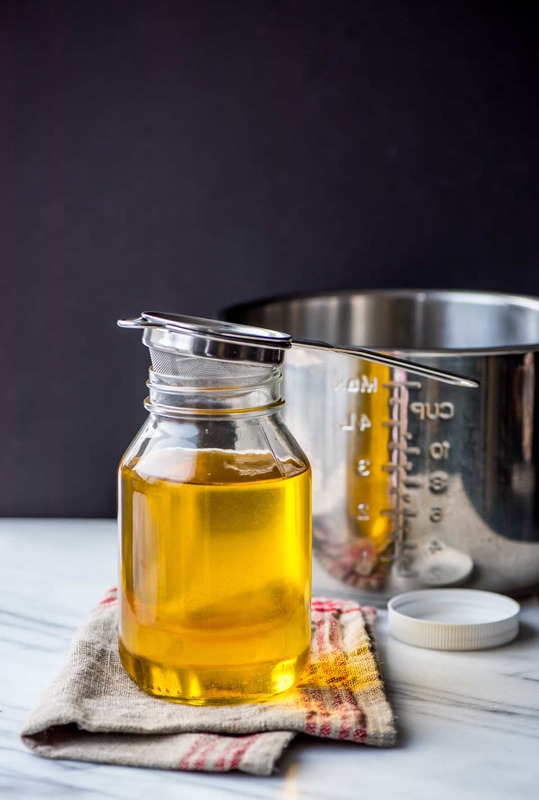 Ghee versus clarified butter – How are they different? Bring unsalted butter to a boil. In a few minutes, it will turn frothy. Once the froth settles down, the milk solids will separate and sink to the bottom and you’ll see a clear liquid on top. Take it off heat immediately and what you have now is clarified butter. To make ghee, lower the heat and continue to cook until the milk solids turn brown. This gives ghee the distinct nutty flavor and aroma. Ghee is predominantly used in South Asian cooking curries, dal, rice dishes (biryanis) etc whereas clarified butter is best for pan frying. 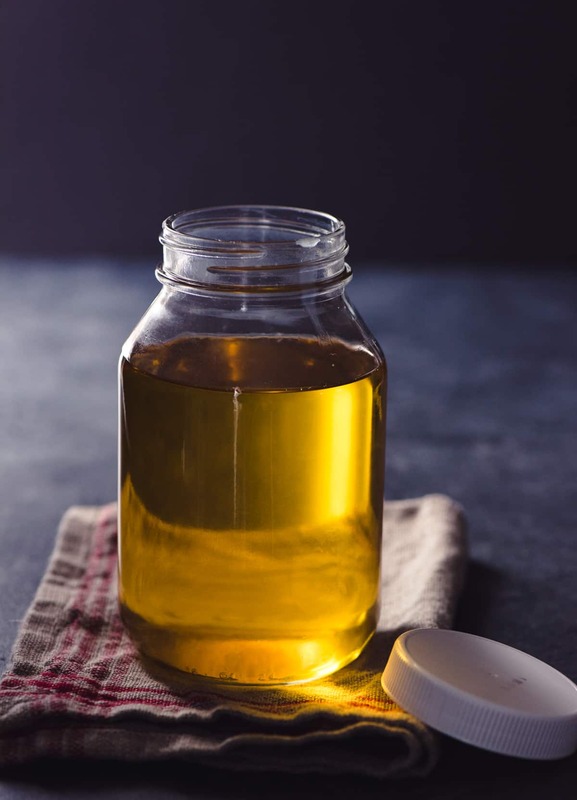 Ghee has a unique short chain fatty structure which helps mobilize fats from stubborn fat areas in your body. In short, it helps you lose weight according to Rujuta Diwekar – India’s top fitness expert. Click here to read more about the goodness of ghee. How is ghee better than butter? Ghee does not contain lactose or casein like butter does thus making it suitable for folks who are lactose or casein-sensitive. Other than supporting weight loss, ghee also helps build strong bones and is rich in fat-soluble vitamins. Ghee also has a high smoke point which ensures that ghee won’t burn as quickly as butter. 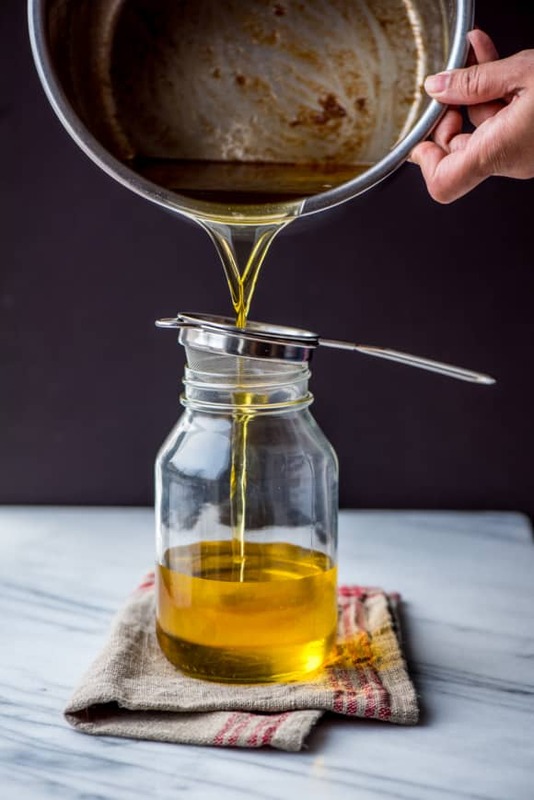 Lastly, ghee contains a higher amount of medium and short-chain fatty acids compared to butter and thus putting it in the category of heart-healthy fat that is good for you. Which butter is best to make ghee? I like Amish unsalted butter the best, followed by Kerry Gold and Costco organic unsalted butter. Do you need to refrigerate ghee? 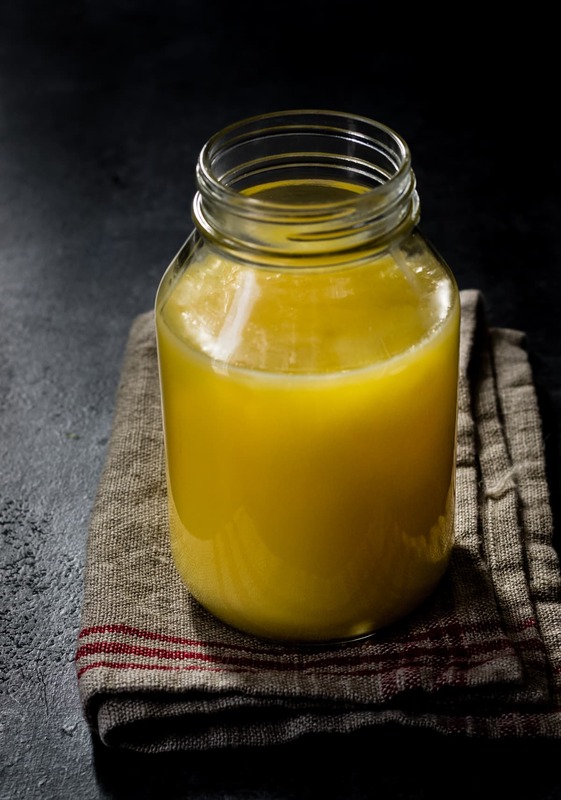 Ghee stores well in a kitchen cabinet for up to 3 months and in a refrigerator up to a year. What to do with leftover milk solids after making ghee? Add the milk solids to your soup, dals/curries or add it to your rice while it is cooking. Use it to make dough for rotis or chapatis. Saute it along with 1/2 a cup of wheat flour or rice flour until the flour turns light brown. Add sugar (or jaggery powder) and cardamom powder and mix well. Take off heat. Enjoy! Combine the milk solids with a cup of water and bring this mixture to a boil. Strain it and discard the milk solids. Store the liquid in the refrigerator after it cools down overnight. You’ll see a thick layer of ghee floating on the surface the next day. After you skim the ghee from the top, use the remaining water to make dough for chapatis/rotis. 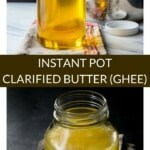 How to make homemade ghee in Instant Pot? 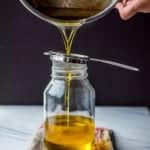 How to prevent ghee from burning? With most Instant Pot recipes, I would recommend following the cooking times to a T but not with ghee. When you are making ghee from butter at home, more than looking at the clock, you need to look for visual cues. That’s where this post is going to come handy. Follow the directions and you’ll never burn your ghee again. If you are looking for a recipe to make homemade ghee on the stove top, click here to get the recipe. ★ Did you make this recipe? Please rate it by clicking on the stars below! Burnt your ghee? Never again! 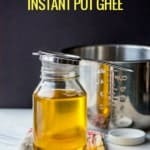 Follow this detailed fail-proof recipe with step by step pictures to make ghee in an Instant Pot. Save money and say goodbye to storebought ghee. Place the steel insert in the Instant Pot and press the Saute function. Press the Adjust button to move the selection to “Normal” and wait till the display reads “Hot.” Add butter and let it melt. As the butter melts, it will start getting frothy. Give it a quick stir and continue to cook. The froth will start to disappear slowly and will look the image below. The milk solids will start moving towards the bottom. Click cancel once the melted butter becomes transparent and you can see the milk solids below. This is clarified butter and if that's what you want to make, remove the steel insert carefully from the Instant Pot to stop the cooking process. 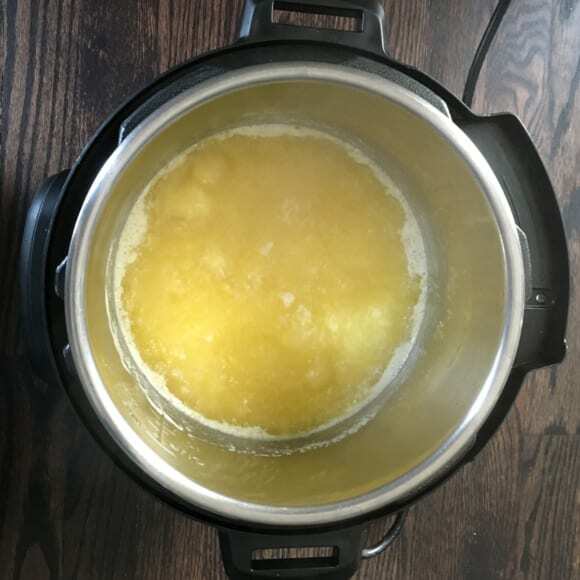 To make ghee, unplug the Instant Pot but leave the pot in and proceed to the next step. The ghee will continue to cook and you will see the milk solids turn brown and you will be left behind with a clear liquid. Let it cool for 5-10 minutes before straining into a glass jar. Apply the lid only after the ghee has completely cooled down. Store it at room temperature for a month or refrigerate it for it to last longer. It took me approximately 20 minutes to make ghee from 2 lbs of butter. Making 1lb of butter takes about 9-10 minutes. Though the times are provided, I would strongly recommend that you focus more on the visual cues rather than the clock because depending on the quality and temperature of the butter, cooking times may vary. So does the whey simmer away since there is no skimming of the foam mentioned? Yes, Wendy. Sorry for the delay in response, your comment ended up in spam. Is there any advantage using an instant pot vs doing this on a stove top? Less splattering since the IP pot is deeper so I can do a larger amount using Instant Pot. I used a pound of unsalted Kerrygold butter. After 40 minutes on Saute Normal, there was still plenty of froth, but the solids that had reached the bottom were very dark. I finally gave up and stopped the process. Hi there! Did you stir the ghee as outlined in step 2? Mine turned brown ? I think the problem I faced was I used 2 small blocks(1/2lb) and i was waiting for all the froth to go away even though I saw solids settling down. Also the solids turned brown quickly. Should I take out the IP liner as soon as I see the solids getting brown? Sorry this was my first time making ghee. Hi Shruti – Now that it has cooled down. How does it look? Unless it is not burnt, you are fine. I shut it off once it appears transparent and the ghee continues to cook or you could do it your way, wait till the milk solids turn brown and then remove the steel insert. Either way is fine. Let me know if you have any questions. Good job with your first attempt at making ghee! Thanks Anushree. It looks beige in color after cooling down…it smells more nutty than ghee?. I guess I shouldn’t have waited for all the froth to disappear and should have removed it as soon as I saw the solids getting brown. Do you think soup setting would work better? And is it okay to remove it before all the froth disappears? Your step by step process actually motivated me to go for it. Thanks for posting such detailed recipe. Hi Shruti – Don’t have to wait for all the froth to disappear. The key is to look for the milk solids sinking and the ghee turning transparent. 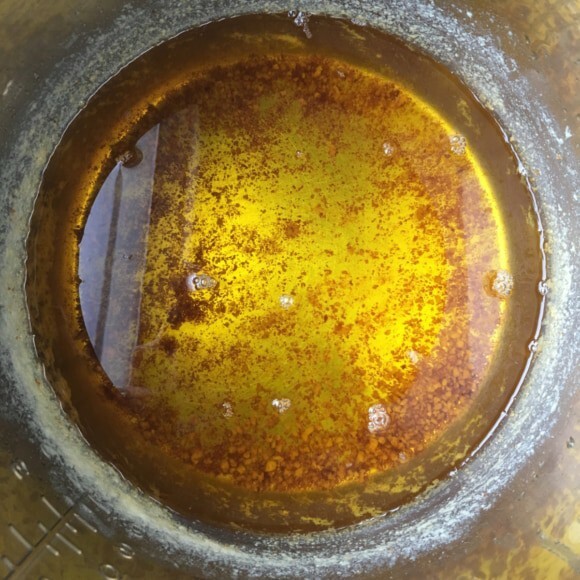 My first attempt at ghee had similar results. The change happens in a split second. You’ll learn how to watch it closely with time :-). Can’t wait to see how your next batch turns up. Sure thing, I will post one soon.